Helen's face launched a thousand ships, to say nothing of countless books, dramas, poems, paintings, and operas. She is arguably the most notorious woman in Western culture. What makes her so engaging, so consequential? Like an ancient wall layered with millennia of graffiti, Helen preserves the human record. Her story and our story are not to be plied apart. She is woman as we have idealized, worshipped, slandered, celebrated, constructed and deconstructed her. Helen, for better or for worse, in all her metamorphoses, represents the complex, intact fossil record of woman in Western culture. The story of Helen is the story of woman. 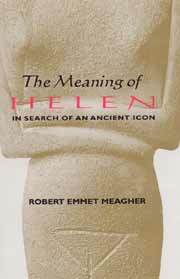 The Meaning Of Helen: In Search Of An Ancient Icon by Robert Emmet Meagher (Professor of Humanities in the School of Humanities, Arts, and Cultural Studies at Hampshire College, Amherst, Massachusetts) is an impressive and scholarly study of the legendary Helen of Greek antiquity whose behavior triggered the downfall of Troy. Reported as having “the face that launched a thousand ships), Western culture has regarded Helen as an iconic standard of beauty ever since those ancient days. Deftly blending a meticulously researched history with philosophy, and as a study of evolving cultural perspectives, The Meaning Of Helen draws an unforgettable metaphor between the story of Helen and the story of womankind. Enhanced with exhaustive notes and an appendix on “History and Imagination”, The Meaning Of Helen is a superbly written and presented work that should be a part of every college and university Greek mythology reference collection. Meagher, professor of humanities at Hampshire College in Amherst, MA, shows that in all her metamorphoses Helen represents the complex record of woman in western culture. After a five-page introduction, he treats Helen and history, the many Helens, the duality of Helen, the first Helen, and the truth of Helen.He concludes that the humanity and the divinity of woman come into focus in Helen, the most notorious woman of the ancient world, equally human and divine, woman incarnate and eternal. A ten-page appendix deals with history and imagination. The work was originally published by Continuum Publishing of New York in 1995. In his introduction, M indicates affeminist direction for his study of the Helen myth, claiming it represents an archetypal misogynistic sentiment in western culture. He claims Helen is a figure who inspirres both desire and hate among men. The book itself consists of a careful anthropological exposition of the cult of Helen from her beginnings to her appearances in Greek tragedy, with full scholarly apparatus of footnotes. By comparing her to figures in eastern mythology (Astarte, Ishtar) and to other figures in Greek mythology (Aphrodite, Pandora) he sets out a thorough exposition of the position of women in archaic Greek religion and society. He draws particularly from Hesiod, Gilgamesh and the archaeological record; even the Greek Goddess gets a look-in. He analyzes the myth in terms of comparative religion and anthropology. Helen is viewed not so much as literary character but as a religious or psychological force who has many facets or dualities. He puts forward such opposing dichotomies as eros/eris (desire/strife) or women's humanity and divinity (the goddess/whore figure) which Helen embodies. She is not the only woman treated here, as much of the exposition deals with many other female figures from an astonishingly wide range of material from the whole of the Mediterranean world. This is a serious, almost solemn account of Helen in which M, as a man, appears to feel guilty for creating what he presents as a gloomy misogynistic picture. Although he analizes the fantasy and the reality of Helen, the attractions of the fantastic figure are firmly repelled. An acquaintance with the basic forms of myth of Helen is expected along with a knowledge of much of Homer and the whole of Greek tragedy. As might be expected, none of this is easy going and this is not a book to be recommended to students in the sixth form. A first year anthropology undergradute might find it pretty demanding. A specialilst in mythology, however will find much to ponder. The story of Helen is the story of woman, loved and hated beyond recognition. No woman from the ancient past is as nitorium to this day. No woman at the time remains more silent. breaking the silence is a long labor, to which this volume makes some small contribution. This captivating book takes as a symbol of this perception of womanhood in ancient Greece. The thesis is neatly developed, the argument backed up with striking data, and the presentation open up challengiing perspectives. It is a compelling written and an exemplary work of scholarship and humanish. This captivating volume takes Helen as a symbol of the perception of womanhood in ancient Greece . . . and compares her to Aphrodite and a number of female characters in myth. . . The thesis is neatly develped; the argument is backed up by striking data; the presentation opens up challenging perspectives. In a word, the book renews our perception of Helen and deserves our full attention. A book surely destined to become a historical point de depart in thought and understanding;emdash%a remarkable achievement! . . . There is in Meagher a rare touch of genius. He is not only a great scholar, but a great humanist in the full, positive sense of hte word." Meagher, an eminent classical scholar, seeks first to ascertain the original Helen, whom he finds to have been a supreme goddess of life and death. He then explores the way that an emerging ideology of dualism and hierarchy transformed Helen from a positive image of women's power into a negative one. Magnificently researched and compellingly written, this is an exemplary work of scholarship and humanism. A powerful book, well organized and well argued.